Orphans Clara and Jacob Marley live by their wits, scavenging for scraps in the poorest alleyways of London, in the shadow of the workhouse. Every night, Jake promises his little sister `tomorrow will be better' and when the chance to escape poverty comes their way, he seizes it despite the terrible price. 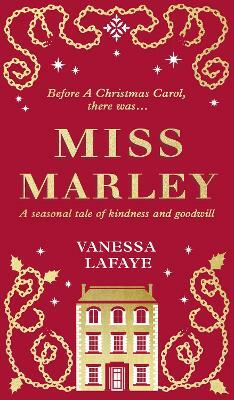 In Miss Marley, Vanessa Lafaye weaves a spellbinding Dickensian tale of ghosts, goodwill and hope - a perfect prequel to A Christmas Carol. “A Christmas Carol” by Dickens is dominated by one fact: Jacob Marley is dead. This book takes that fact and gives a completely different view; that of a sister who loved him, feared for him and was loyal in every respect. A hauntingly beautiful book about a young woman who saw the painful reality behind a life devoted to monetary profit at the cost of everything else, Lafaye has created a character who can stand next to the much loved characters of Dickens’ well known story. Bitterly hard, sad and full of longing, this is a book that manages to convey a hope far beyond usual romantic endings. I was pleased to receive a proof copy of a short novel which nevertheless has an enormous emotional impact. This book conveys an atmosphere of Victorian London which strives to be festive, despite the bleak existence of a significant number of its inhabitants. Jacob and Clara are children who have fallen on hard times, slipped through any safety net of family life as their unfortunate parents have died. They have, however, so much hope of a return to a pleasant and comfortable life. Jacob fiercely protects his sister, promising her that “tomorrow will be better”, as she gazes fascinated at a dolls’ house representing a world that now only exists in her memory. Tragically, their only chance survival comes at a cost, and while Clara is grateful for the chance, she realises disturbingly early that Jacob is changing. Women in this short book are given the perspective that love, hope and compassion are the key to life, and this is in sharp and significant contrast to the men’s view of the world. While I have read a lot of Dickens, I have often been disappointed in his depiction of female characters. This book triumphantly overturns that problem, making Clara and indeed Belle real people, who come to dominate the novel in their steadfast attachment to the men that they love. This is a book of the sights, sounds and tastes of London, in all its challenges and humanity; the small bits of food and money, the contrasts between rich and poor, the constant quest to live better lives. It undoubtedly has a dream like quality, as Clara appreciates the beauty of the flowers, of the seasons, of people around her. This is in sharp contrast to Jacob, who also longs for better things, but is frightened of loss in so many ways. His desire for a better life for himself and his sister at whatever the cost means that he can continually justify himself by saying “It’s nothing personal. Just business” even though he acknowledges that others suffer. The sharp contrast between rich and poor, compassion and business gives a resoundingly clear motive for the much loved classic story of Scrooge and his redemption. This is an admirable book, conveying the reality of a way of life that many have tried to capture, and more than establishing an additional and significant character in the much loved world of “A Christmas Carol”.